Dangerous weather and wildfire can catch anybody off guard. If you and your home face imminent danger, the best course of action is to leave immediately. However, there’s often time to pack your bags and load your vehicle with important personal and household items, from keys and cash to hard drives and family photos. To make the process less stressful and more efficient, know before you go. Use this “fill in the blanks” page to put together a prioritized checklist. Then, if you have to leave your home, start at the top of the list and work your way down until your vehicle is full or you have to leave. 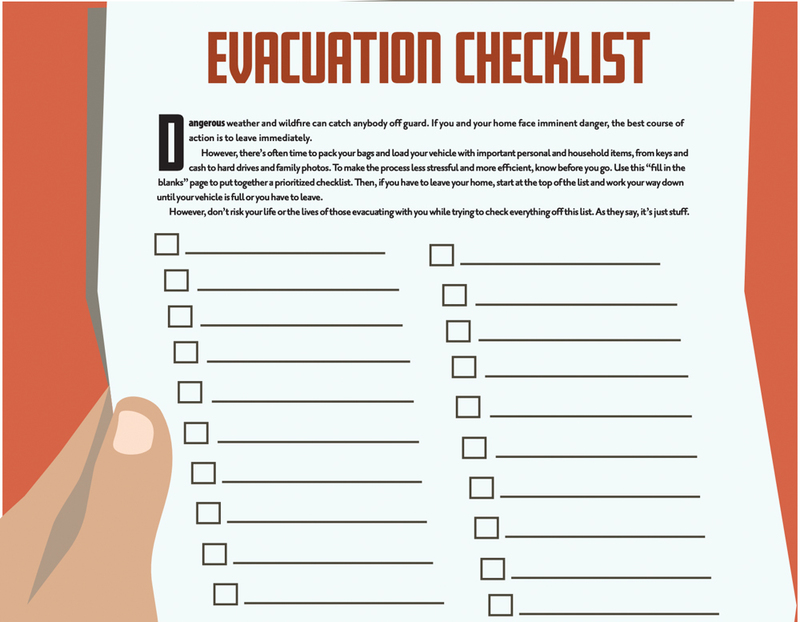 However, don’t risk your life or the lives of those evacuating with you while trying to check everything off this list. As they say, it’s just stuff.